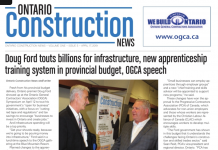 The Carpenters District Council of Ontario (CDCO) has co-ordinated an extensive, practical and responsive training system, providing skills and upgrading to thousands of pre-apprentices, apprentices and skilled carpenters at locals across the province. The union’s College of Carpentry and Allied Trades (CCAT) responds to employer and market needs and can adapt its programs on short notice to accommodate special requirements. The training also provides an entry-point for first or second career opportunities for people who might not otherwise have the opportunity to earn a rewarding income, including disadvantaged urban youth, First Nations community members, and former soldiers in co-operation with Helmets to Hardhats. The program is massive. 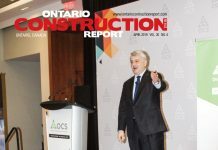 Selva says as an example, in Carpenters Local 27 in the GTA, apprentices made up 25 per cent of the union’s membership in 2007; in 2014 they accounted for close to 40 per cent. The union trained 5,600 registered apprentices and provided upgrading and safety training to about 14,000 members across the province in 2013. This volume is impressive, considering that the overall provincial union membership is about 25,000, meaning that most members have taken at least one course sometime in the past year. Several locals operate their own training centres, but they are all now co-ordinated at the provincial level, allowing for the union to respond to local conditions and mobilize resources from other centres when necessary. Selva says the Toronto centre alone puts through between 450 and 500 pre-apprentices and apprentices each year, and trains another 3,500 members in health and safety programs. • The CHOICE Program, a partnership with Toronto Community Housing (TCH) Corporation, the YMCA and the Ministry of Trades, Colleges and Universities, working with youth from “at risk” communities – primarily TCH properties. Carpenters Local 27 president Mike Yorke said there were about 15 grads. • The Toronto Inner City Rugby Foundation (TIRF) program, a partnership with Brook Restoration, the Carpenters and the Toronto Rugby Foundation, which graduated 12. Selva say the union’s training initiatives have been designed to combine hands-on practical value and efficiency. Many upgrading and safety courses are conducted during evenings and weekends. The training centres are busiest in the winter, when site work slows down and apprentices can use the in-house training time to meet their classroom training hours requirements. Local 27, for example, has about 15 instructors at two sites including a recently acquired 52,000 sq. ft. building with shops, classroom and administrative areas. The union is also developing training programs in infrastructure, bridge and marine construction, reflecting the trend towards more infrastructure projects. Previous articleWhy should you implement Lean practices in your contracting business?